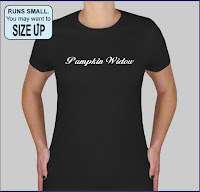 Get this great shirt for your significant other who has been a "widow" during the pumpkin growing season. Perfect for wearing to the upcoming weigh-offs. Very limited quantities so order now. The 1204 Scherber AKA "Ricky"
Dear Jerry Seinfeld. I hope this pumpkin proves two things. First, giant pumpkin don't have to be ugly. Second, this pumpkin was named after Ricky Gervais and hopefully it proves that the "British" don't have to be ugly (if you watched me on NBC you'll know what I am talking about). Four weeks from today is the vine cutting. At this point I'm just hoping that I have a pumpkin at that time. The 1204 pumpkin is still holding together but I'd give it a 40% chance that it will still be around by the weigh-off at Jared's on September 24th. Growth has slowed down considerably. I'm praying that it will make it. The 868 pumpkin is growing slow as well but still growing. I continue to get splits on the face of the pumpkin and those splits have now started to go into the stem area where I found a little rot forming. I am hoping that sulfur powder isn't overly toxic because I've used a fair amount of it and bleach around the stem. I also re-covered pumpkin face area to help it dry out. We have had three days in a row of record heat in Denver. You can't water the pumpkin plants enough when it gets this way. I watered 25 minutes more than I usually do yesterday and when I was checking the soil this morning there were still areas that were a bit drier than I would prefer. Hard to get the pumpkins to do to much growth when it is this warm. Looking forward to some relief. At this time of year you start to see a lot of aging in the plants and pumpkin growth has slowed down a lot. The oldest leaves have died off, most of the leaves look tired and now the youngest leaves on the edges of the plant are doing a good portion of the work to make the pumpkin grow. I usually see a lot of sucker vines popping up on the plant this time of year. A hormonal change has happened in the plant and it knows it is coming down to the last month of growth and it is doing everything it can to produce more posterity. I find these sucker vines irritating and pain to get rid of. There is a fine balance between going into the plant to get these vines out and not damaging the older leaves when you do so. One thing you have to watch for is new pumpkins growing in the patch. Even with a watchful eye, I've pulled out 60 pound pumpkins that were well hidden in the vines. The last couple of days I've given the plants NutriCal, calcium and Fish & Seaweed. Very slow growth on the 868 pumpkin. The 1204 is still growing quickly for this time of year. 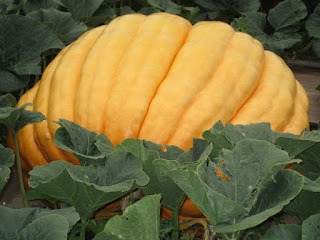 At 150 pounds smaller than my big pumpkin, the 868 pumpkin (aka Jerry) is where I am hoping now to get over 1,000 pounds this year. It is my last hope. There are 47 growing days left until the weigh-off at Nick's Nursery so as of right now my plan is to take it their. If I can get about 39 more inches on this pumpkin I should make the 1,000 pound mark. This pumpkin was a later pollination on July 4th so it will be 95 days old then which is young enough that it should be still growing a little by weigh-off time if the weather is good. The picture to the right makes this pumpkin look more orange than it really is in normal light. The morning orange sky I think made the pumpkin less pale orange than how it really looks. As you can see there are no dill rings so far for this pumpkin and very light ribbing. I am very sorry to announce that Ricky the pumpkin formed a crack into the cavity this morning and as a result will not be going to any weigh-offs this year. An internal crack called a Dill Ring formed inside the pumpkin and intersected a deep rib and split the pumpkin open this morning. Nothing could be done about it and it happens to a lot of growers. 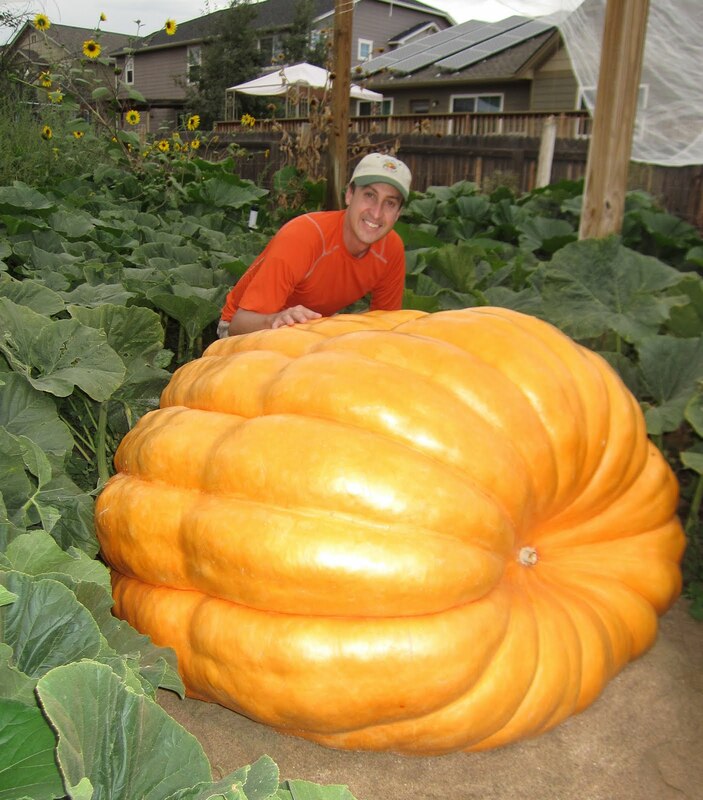 Ricky, also known as the big pumpkin, was on pace to easily break my personal best weight of 868 pounds. If it stayed on track it probably would have hit about 1,100 pounds. I'll take measurements on it this evening to get an unofficial weight. This pumpkin was named "Ricky" after Ricky Gervais whom I took a wise crack at while on NBC's The Marriage Ref this summer. 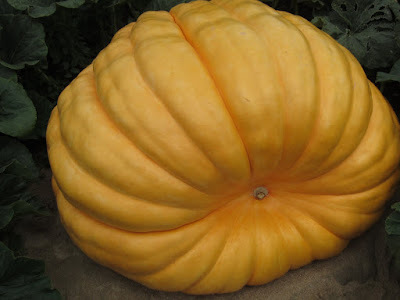 The cross of the pumpkin is 1204 Scherber x 1810 Stevens (in other words I crossed my pumpkin with a seed from last year's World Record pumpkin). Seeds will be available in a month at http://seeds.denverpumpkins.com. As the saying goes, "If you ain't blowin them you ain't growing em." But the saying also goes, "If you are blowin them then you ain't showing em." The other pumpkin, Jerry, is still growing and the cracks on it are of a different kind and of less concern so we will put our efforts into that pumpkin now. Pictured below is the little split that caused all of the trouble. Got a double dose of trouble this morning. 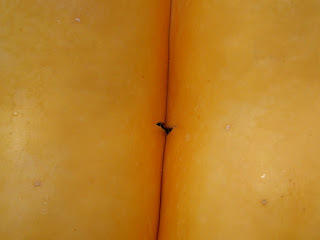 Discovered on the 868 pumpkin a split along one of the ribs on the top face of the pumpkin. Not too worried about it now. That area tends to be thicker on the pumpkin and it looks more like a growing pain than it does a pumpkin that wants to open up. The skin on this pumpkin has gotten kind of tough this last week and as a result it doesn't stretch with the growth quite as easily. I put a 30% solution of bleach on the crack area and then put sulfur powder on it. Of more concern is the oozing that I found on the main vine when I was working on the crack. About 8 inches past the stem I saw a big spot of clear ooze coming out of the main vine. I applied the same 30% bleach and sulfur powder on it too. I then covered the pumpkin today so it wouldn't get wet from the overhead watering that goes on throughout the day. This evening I checked both spots and both areas were dry with no oozing which was great to see. I'll keep my eye on both spots because if you can get on this stuff early you are way better off down the road. It has gotten kind of difficult to the measure the 1204 Scherber pumpkin (AKA Ricky) these days. It has lots of ribs and none of the ribs follow a consistent path so measuring and measuring consistently has become a challenge. Yesterday I found that the spot that I have been measuring on no longer is the biggest path around the pumpkin as other ribs have started to bulge out more. With my measurements I'm mostly looking to find out if the pumpkin is growing properly and if I need to give the plants more water or more fertilizer. These days I've been a bit busy so every other day or every third day do I get a chance to put a measuring tape around the pumpkins. Today's circumference measurement on the 1204 pumpkin was 151 inches. I used the last of my Actinovate on the pumpkin plants this evening. Actinovate, as I've mentioned before, is a friendly fungus that can fight off powdery mildew as well as a number of other bad fungus and bacteria. This is the first year I've used and I believe it works. I've seen some plants in the yard and neighborhood with bad cases of powdery mildew but as of right now I maybe have four leaves on each plant with small spots of mildew and that is about it. This morning I gave my plants some BioSol 7-2-3 grandular fertilizer. Growth on both plants and particularly the 868 plant have tapered off. That is common at this point of the season but the 868 is only putting on 15 pounds a day right now which is about 5 pounds less per day than where I would hope for it to be at right now. Yesterday was the annual RMGVG patch tour. With it you go around and visit others growers pumpkin patches to see how they grow but more importantly you get a chance to spy on the other competitors pumpkins. The big winner so far this year was Joe Scherber. 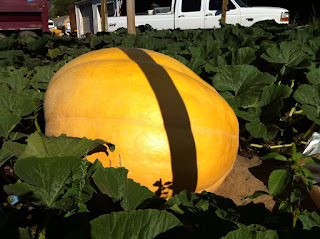 There has been some talk about Ken's pumpkin having the biggest measurements on bigpumpkins.com but I know what Joe's measurements were on that same day and lets just say that it was 400 pounds bigger than any other pumpkin we saw yesterday. His pumpkin is older than Ken's but still packing on the pounds. A very impressive white pumpkin grown from the 1725 Harp seed. Tomorrow is the Rocky Mountain Giant Vegetable Growers annual patch tour. The club gets together to talk pumpkins. Tour different pumpkin patches around Denver and have some BBQ. It's almost as fun as the 4th of July. If you are interested in coming let me know and I'll give you the details. Everyone is welcome. $10 for non-club memebers for the BBQ. Gave the plants some magnesium and CalCarb this evening. Growth on both of the pumpkins have been a little disappointing this week. I think the hotter weather we had in Denver the previous few days had and impact on growth. I gave the plants a little more water the last two days and an extra helping of Fish & Seaweed tonight to help them kick back into gear. I also gave the plants a little calcium this evening. Long time friend Jeff Tyus was invited over to the pumpkin patch today for his annual adjustment of the pumpkins. Jeff is a power lifter and his good wife once bought him a shirt that said, "I may not be smart but I can lift heavy things over my head." I love Jeff. And his ability to move heavy pumpkins so they are better positioned on the vine. A Colorado grower recently had his pumpkin nearly picked off the vine because the pumpkin grew into the vine and nearly snapped it off. Last year, after trying to move the pumpkins myself, Jeff literally moved one of them with just a shoulder and one of his arms. It was very impressive. This year he had to use both arms on the 1204 and 868 plant. He didn't know it but he made my day when he said that both pumpkins were much more dense than last year's. My two pumpkins last year went very light to the charts so I have a little hope that maybe I can have the pumpkins hit the chart this year. I have zero expectations for going over the charts. I went into the Biz bag of tricks today and put down a quarter cup of organic Richlawn fertilizer with humic acid mixed in with it to each plant. Although I give the plants a foliar fertilizer on a weekly basis I haven't gave the plants much NPK on the soil and I was concerned that the roots might start to bonk without a little something to get them through the next 50 days. I should mention that my kid's pumpkin has been growing nicely over the last week. There was a couple of times early in the season that I didn't think the plant would make it. About a month ago it finally snapped out of it and started growing good. Hard to tell yet but they might get a white pumpkin. The 1204 put on it's single biggest one day gain today that I recorded. I'd love to see that trend continue. The 868 pumpkin's growth curve hasn't kept pace with where it was at before. Will be interesting to see what happens with it over the next two weeks. Yesterday I gave the plants some magnesium, calcium and humic acid. Today I gave the plants some fish & seaweed with a touch of humic acid. Not sure if I should call this pumpkin "Ricky" or "fat bottomed girl." Maybe I'll stick with Ricky. As mentioned before, this year I am growing the 1204 Scherber (1421 Stelts x 1725 Harp) and the 868 Johnson (1161 Rodonis x 1544 Reviere). It has been interesting seeing how mama and papa's genetics effect the progeny. There are three 1204 Scherber plants being grown this year in Colorado. Mine tends to take after the 1725 Harp (mama) in appearance and growth. One of the other 1204 Scherbers looks more like the 1421 Stelts (papa). The third looks more like a hybrid of the two plants. Like children, you never know what you are going to get from a seed. Slower growth on my 1204 pumpkin today. Not sure why. Maybe a bad measurement either yesteday or today. The 868 grow the same as the day before and actualy, based on the measurements outgrew the 1204 by 5 pounds today. It will be interesting to see what tomorrows measurements look like. Had to cut off some side vines around the pumpkins today. The pumpkins were getting close to the vines and I don't like the leaves touching the pumpkins skin because it can scuff it all up. Gave both plants some compost tea this evening. I got the latest app for giant pumpkin growers and gave it a try today. Pumpkin Pro is an iphone app that helps you calculate a pumpkins weight based on the Over the Top (OTT) measurements. I like it because it was always hard to remember the measurements by the time I got to the house so I could look them up on the chart. Now I don't have to remember anymore. Gave the pumpkin plants some Actinovate this evening. August is when powdery mildew tends to show up and Actinovate helps fight powdery mildew among other things. The important thing is to stop it before it starts because you can't get rid of powdery mildew once it shows up. You can only hope to contain it.